State-of-the-art surge protection board includes RJ45 data, AC line protection, common mode noise filter, and hybrid lightning protection. This surge protection circuit was designed by one of the world's leading surge protection engineers to meet existing and future standards for surge control. It uses the most up-to-date hybrid technology including gas tube, MOV, intrinsic fusing and TVS components. It also includes a common-mode noise filter and protection for RJ45 Ethernet data-line connections. 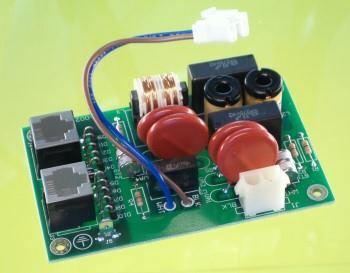 This circuit is ideal for applications involving wireless Internet, WiFi, traffic signal, security cameras, solar installations and other outdoor applications.